We celebrated the New Year in our typical lavish and opulent style. The Cristal was flowing as we partied into the wee hours on the deck of our yacht. Not really. I just made that up but it sounds so much more high flying and exciting than the reality which was we were all asleep by 10 pm because we were tired from sanding and painting in the damp and cold. And while Ceol Mor might technically be a yacht , I just can not refer to her as such without feeling like a complete tool. In my mind, a yacht does not require me ever dealing with the contents of a holding tank or manual labor on my part of any kind. A boat, does however. So in truthfulness I will admit we rang in the New Year by working on the boat. 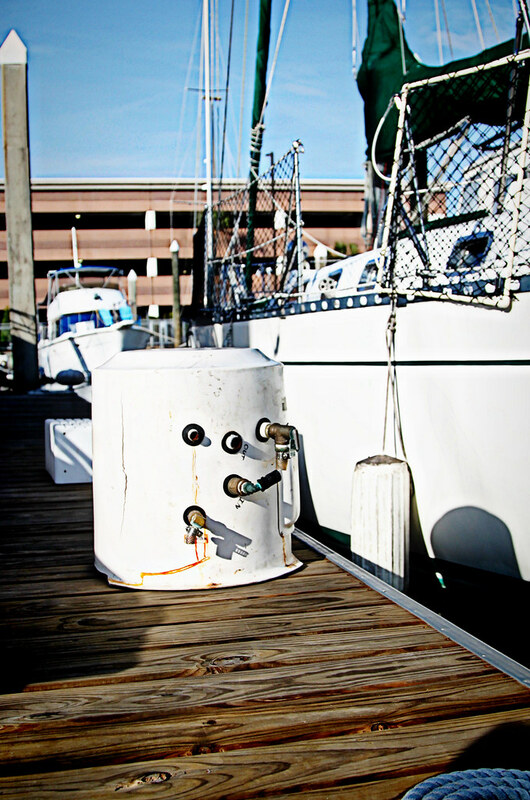 Mark removed our water heater from under the aft cabin berth. I believe our heater is the very same model Joshua Slocum used on his boat. We are talking about seriously old equipment. We know it was original to the boat because the darned thing was too big to fit through the cabin door. They must have built the boat around it. Mark managed to get it off the boat with an assist from his boat buddy Tim and a hacksaw. Once the heater was removed we were able to finally access the port side engine mounts. We can certainly improve upon the less than desirable angle iron and wood mounting (hey, you boat yard peeps do realize that bolts simply mounted through wood will compress over time, don't you?) with the addition of metal plates. Eventually, some day a repower will happen (Mmmm Beta) and when it does we can redesign the engine room to have a much more solid engine mounting but for now, the engine seems to keep on keeping on and hopefully we can cut down on the shake, rattle and roll factor a bit by beefing up what we have. 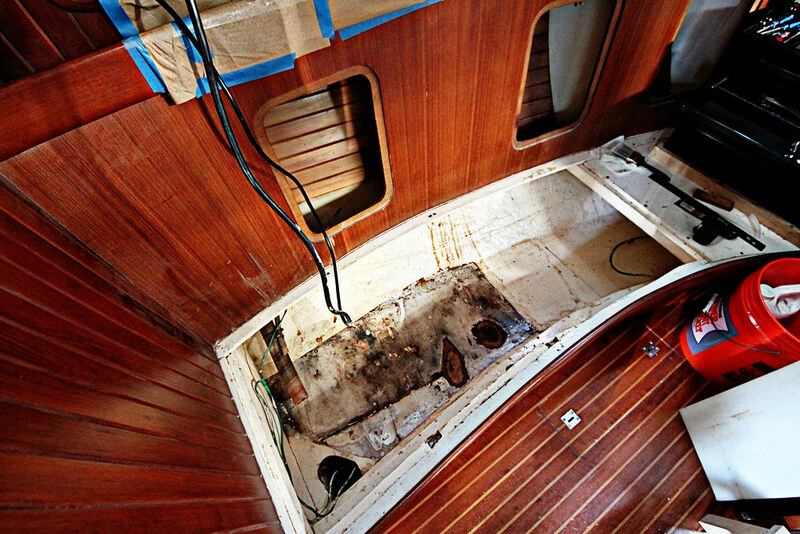 With the heater out from underneath the girls' berth we found what one always seems to find on these old boats- rot. 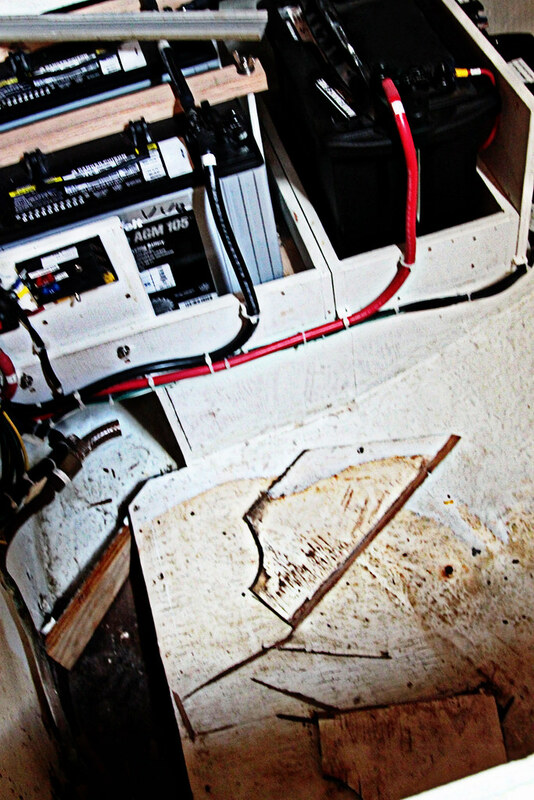 The plywood supporting the heater had gotten wet and it did what wood does when it gets wet- it rotted. On a positive note, this is nothing really structural and therefore is pretty to easy to set to rights by cutting new wood and a lot of sanding and painting. A new, shiny water heater will be installed in the very near future. As part of the prep for redoing the entire plumbing system, Mark removed our water tank from under the port side salon settee. Guess what we found there? Just guess? More rot. This time the culprit seems to have been the leaking chain plates which if you've been following along you know was a huge, long and laborious job to correct. I was really hoping we had seen the last of issues from that particular defect. No worries. Its not structural and my sanding and roll and tip skills are getting quite good. I am pretty darned gleeful right now. The reason being is that Mark has finally contracted with a really talented boatwright to take out our forward head. This will be just about the best Christmas present I could ever receive. We met him last year through Mark's boat friend Tim and I admired the work he had done on other boats as well as the gorgeous wooden dinghy he had built for himself. I was ready to hire him last year but Mark wasn't so when the boatwright returned to Maine last fall I thought we had missed our chance . He's back in Texas and Mark is ready so it looks like a go.He does beautiful work and I am so proud of Mark for turning over a project to someone else. Just because you CAN do it all yourself doesn't mean that you shouldn't enlist the aid of a professional from time to time. With an assist on the carpentry we just might have Ceol Mor ready before the 2014 hurricane season cranks up. This photo has absolutely nothing to do with the boat refit. I added it because Kitty actually sat still for about 3 minutes, there are no remnants of breakfast on her face and her hair is somewhat brushed. This is worthy of note. 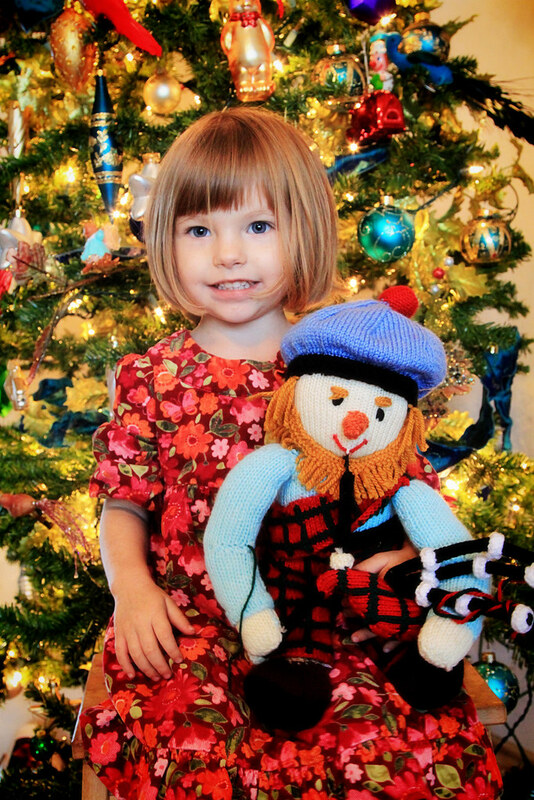 Its Kitty and Angus- the wee bagpiper Mark brought back from Scotland for her Christmas present. She seriously loves the funny little guy.